ATHENS and APOLLO are trademarks of Athens Foods, Inc © Athens Foods 2014 Cleveland OH. All rights reserved. Lay a sheet of Phyllo dough on a work surface. Spray lightly with cooking spray. Lay a second sheet of Phyllo on top of the other. Spray lightly with cooking spray. Fold Phyllo in half horizontally to form a long rectangle creating four layers. Bring up the bottom corner of the Phyllo and roll to the end of the Phyllo to form a pointed cone. Place the cone seam side-down on a parchment lined baking sheet. Insert a small metal ramekin or heat proof shot glass into the open end of the cone to help support it. Repeat the process three more times to create four cones. Bake in 325°F preheated oven for 8- 12 minutes or until lightly browned and crisp. Cool to room temperature. In a medium bowl, mix the yogurt, mascarpone, maple syrup and pumpkin pie spice together. Fold in the pumpkin. 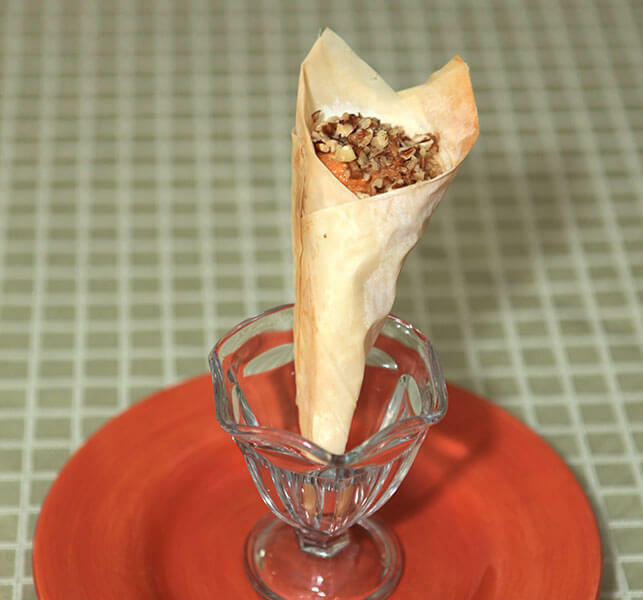 Gently pick up a Phyllo cone and spoon or pipe the pumpkin mixture to fill the cone. Top with chopped pecans. Repeat the process with the remaining cones. Serve immediately. 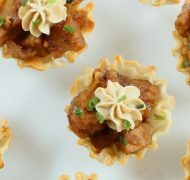 Looking for Phyllo cup appetizers to jazz up your next party? 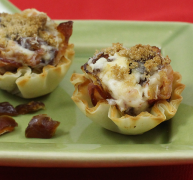 Try these Bacon and Date Pinwheel Mini Shells. Chicken and Waffles is good. Chicken and Phyllo is “Oh my god have you tried this? !” good. Just trust us. These bite-sized appetizers are a little bit of sweet, a little bit of savory, and a whole lot of yumminess. Tried this recipe? Share your experience by leaving a review. Your review will be held for moderation before being posted. ATHENS and APOLLO are trademarks of Athens Foods, Inc © Athens Foods 2019 Cleveland OH. All rights reserved.